I don't know about you but I find it hard to keep my focus on Jesus this time of year, which is crazy because this time of year is SUPPOSED to be about Jesus! Yet somehow the card-sending and gift-buying and gift-wrapping and gift-giving and baking and planning and cleaning and AND AND creep in and take over. Despite trying to fit a year's worth of to-do's into two months, I've actually done much better at keeping Jesus in focus this year, and "The Women of Christmas" by Liz Curtis Higgs has had a lot to do with that. If you've ever been blessed to hear Liz speak, as I was earlier this year, you'll know she has a verse-by-verse teaching style. This is exactly how the book is set up, going through the birth narratives in Luke 1-2 and Matthew 1-2 verse by verse. I find this method helps to slow me down and really ponder what Scripture is teaching. The book starts by focusing first on Elizabeth, mother of John the Baptist, then Mary, mother of Jesus, and finally the prophetess Anna. The details Liz provides give new insight to what for many is a familiar story. For instance, Elizabeth's husband was unable to hear or speak throughout the duration of her pregnancy, and she kept herself in seclusion for five months (Luke 1:24). Imagine how happy she was to receive Mary into her home and have someone to talk to! And think of what a blessing for Mary to hear Elizabeth declare she was carrying the Messiah (Luke 1:43) when she may not have been sure herself if she was pregnant yet. I can imagine Mary traveling to Elizabeth and going over and over in her mind what she could possibly say to Elizabeth to explain what God was doing in her life. What a gift for Mary to hear Elizabeth's declaration? And who could understand Mary better than Elizabeth, and vice versa? 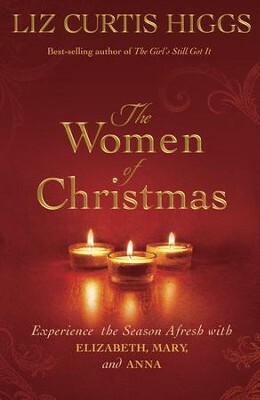 "The Women of Christmas" consists of 8 easy to read chapters (the first chapter took me 12 minutes to read) and has a study guide with discussion questions at the back of the book, making this great for groups as well as individuals. This book is well worth the read regardless of the season. oh this book sounds like something I would like. I do have a question. Are the discussion questions for EACH chapter? I would love to put this on my small group list for next autumn. We typically meet every other week starting in September so it would be perfect to do this just before the Xmas season but as a leader, I like the study books to have questions for each chapter so the women can dig in. I enjoy Liz Curtis Higgs but have never read this particular book. thanks for posting about it!! And enjoy Christmas with your family!! Sorry if I was unclear. There are discussion questions for each chapter, and some of them really make you think. This would be perfect for a fall study!